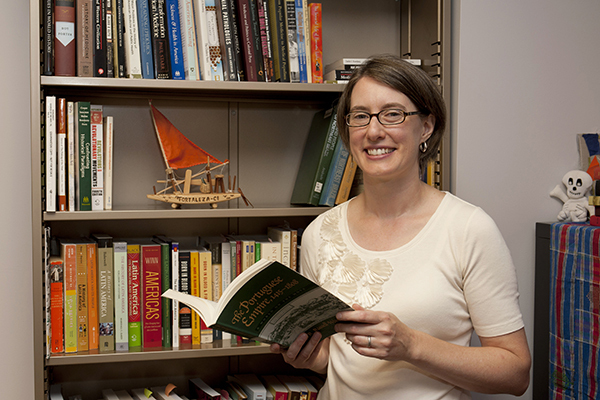 UD historian Eve Buckley has received a competitive grant for her work on a book about drought and social progress in Brazil. 3:22 p.m., April 3, 2014--Eve Buckley, assistant professor of history at the University of Delaware, has been awarded a Summer Stipend grant from the National Endowment for the Humanities (NEH) to support her research on drought, science and social progress in Brazil. Over the past five years, the Summer Stipends program has awarded grants to about 8 percent of applicants, according to the NEH. The grants support two months of continuous, full-time advanced research on a humanities project. Previous support for her work has been provided by a General University Research grant, a Faculty Enrichment Award from UD’s College of Arts and Sciences, and the National Science Foundation. Buckley, who specializes in Brazilian history and the history of science, medicine, health and environment in the 20th century, is interested in the use of science and technology to address problems of poverty and underdevelopment in postcolonial societies. Transforming Brazil’s Desert will explore the work of engineers, economists and other scientists and reformers who were associated with Brazil’s national drought works agency as they tried to achieve social progress for that country and its poorest citizens.